In our next example, what we're going to do is build a form to save settings for our module. So this is when we want to expose certain settings to a user. When we do so, we can use a utility function in Drupal called system settings form which works similar to the confirm form that we just went over. In that it supplies a lot of the utility around the form so our building process is fairly minimal. Let's start by going to the module folder for the input module and we're going to open up step 11 which is called settings-form. Go ahead and copy all the code that's in the file and we're going to paste that over everything that's currently in input dot module and we're going to save it. Okay. Just like with confirm form, our process of creating a system settings form has a couple of steps to it. First of all, we need to generate our form, and then we need to pass it to the utility function to add whatever it needs to to it, and then we need to register the form inside of our hook_menu(). So let's go ahead and look at our hook_menu() first to see how we're setting this page. We'll scroll down to the bottom of hook_menu() and we see we've got a new item here called admin slash config slash input. Whenever you add a path to admin slash config, it will be added to a special directory of configuration pages. So this is a standard among modules so that users know where to find configuration for their module. We're giving it a title of input module which is just the name of our module, a quick description, and for our page callback we're using drupal_get_form. So in our very first example of using forms, this is what we did to generate a page with our form in it. Because the drupal_get_form function returns a build array for the form, it works just as well as wrapping that form in drupal_get_form inside of a page callback. So we're just bypassing that whole process of creating a page to wrap around our form and just calling the form directly. Next, we're passing it page arguments and in this you might remember from previous videos we passed it the name of the function that's returning the build array for our form, and then we're passing it access arguments. 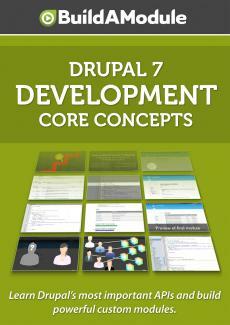 In this one we are using a default function that's provided by Drupal core called access administration pages. So we assume that if somebody has this permission, they can visit this page. And finally, we are defining a file and file path for our function. So you can use file and file path on any menu item in order to separate it out into a separate file and we'll talk about this in the menu system video. So what we're saying is we can look for our function in input dot admin inc and that file is going to be found here and we're using drupal_get_path to get the path to our input module. Okay.